On February 26, Virginia Lawyers Weekly published a special B-section on Elder Law. The Virginia Academy of Elder Law Attorneys is the sponsor of this section, which includes a directory of all members of VAELA. The section was distributed to all our regular subscribers and released early to all attendees of the VAELA UnProgram meeting in Charlottesville on February 23rd and 24th. As a VAELA member, your basic listing was automatically included in the VAELA directory. This listing included name, firm name, address and phone number. VAELA members may also purchase an enhanced listing, which includes a photo, logo, complete contact info, a 100 word practice description and other pertinent information. Enhanced listings significantly stand out among the other listings in the Elder Law section and VAELA Directory. The extra attention your listing will receive provides the value for your additional investment. There are two ways to get an enhanced listing. 2) Buy the enhanced listing for $300. To place your order, please fill out our online form, available through the link below. You also have the option of uploading photo or logo. One of our advertising representatives will contact you for payment (prepayment is required). 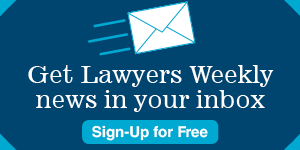 Enhanced listing submission deadline: Feb. 16, 5 p.m.
Elder Law B-Section advertising deadline: Feb. 16, 5 p.m.
Virginia Lawyers Weekly advertising deadline: Feb. 20, 5 p.m.